Passive secretion of potassium ions (or hydrogen ions) may occur in response to the active reabsorption of sodium ions. ^9 Which substances are actively secreted? Passively secreted? ^9 How does the reabsorption of sodium affect the secretion of potassium? The solute concentration of urine, in particular sodium concentration, is affected by hormones such as aldoste-rone and ANP. However the ability of the kidneys to maintain the internal environment rests in large part on their ability to produce a concentrated urine by re-absorbing large volumes of water. In contrast to conditions in the proximal convoluted tubule, the tubular fluid reaching the distal convoluted tubule is hypotonic due to changes that occur through the loop segment of each nephron. The cells lining the distal convoluted tubule and the collecting duct that follows continue to reabsorb sodium ions (chloride ions follow passively) under the influence of aldoste-rone, which the adrenal cortex secretes (see chapter 13, pp. 528-529). In addition, the interstitial fluid surrounding the collecting ducts is hypertonic, particularly in the medulla. These might seem to be ideal conditions for water reabsorption as well. However, the cells lining the later portion of the distal convoluted tubule and the collecting duct are impermeable to water unless antidiuretic hormone is present. Thus, water inside the tubule may be excreted, forming dilute urine. As discussed in chapter 13 (p. 513), neurosecretory cells in the hypothalamus produce antidiuretic hormone (ADH). The posterior lobe of the pituitary gland releases ADH in response to decreasing concentration of water in the body fluids or to decreasing blood volume and blood pressure. When ADH reaches the kidney, it increases permeability of the epithelial cell linings of the distal convoluted tubule and the collecting duct; consequently, water rapidly moves out of these segments by osmosis, especially where the collecting duct passes through the extremely hypertonic medulla. 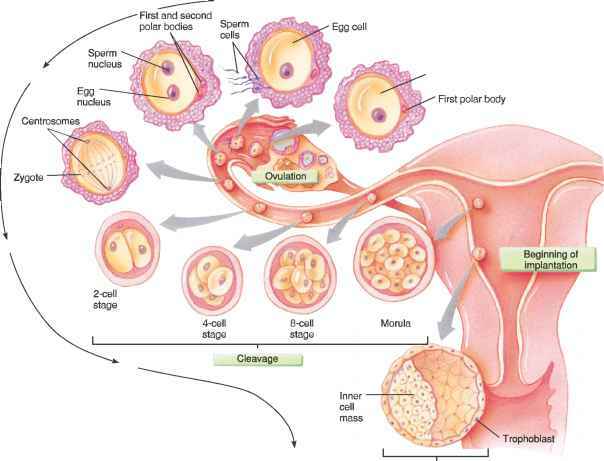 Thus, the urine becomes more concentrated, and water is retained in the internal environment (fig. 20.23). A countercurrent mechanism involving the nephron loops, particularly of the juxtamedullary nephrons, ensures that the medullary interstitial fluid becomes hypertonic. 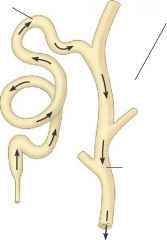 This mechanism is possible because the descending and ascending limbs of the nephron loops lie parallel and very close to one another. The mechanism is named partly for the fact that fluid moving down the descending limb creates a current that is counter to that of the fluid moving up in the ascending limb.